Located on the Mediterranean coast more than 300 kilometers from Madrid, Valencia is the third largest city in Spain. Most famous as the birthplace of paella, Valencia is a charming town where the historic and modern seamlessly coexist. The town features a quaint old town made up of winding cobblestone streets, as well as the futuristic City of Arts and Sciences. It is home to a vibrant culinary scene, historic buildings, a lively atmosphere and pristine beaches. The fastest way to travel from Madrid to Valencia is by plane; the total flight time is one hour. 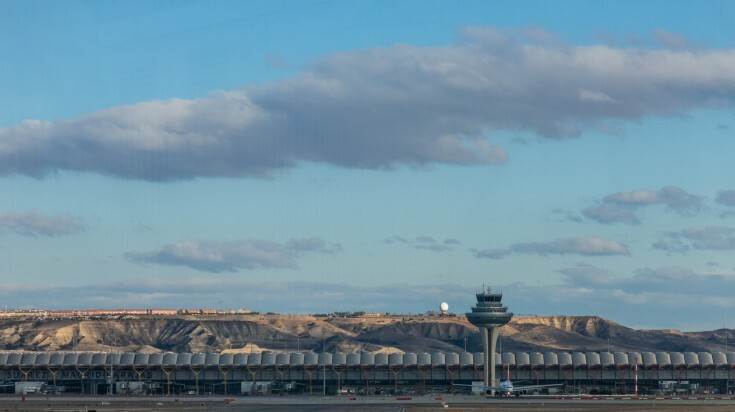 Flights depart from Adolfo Suárez Madrid-Barajas International Airport several times each day throughout the week, including regular flights on weekends. Direct flights are operated by reputable airlines, including Iberia and Air Europe. Planes are generally well maintained, comfortable and reliable. Tickets for Madrid to Valencia flights must be bought online in advance. Prices start as low as USD 50* one-way. To get the best price, book 4 – 6 weeks before your desired departure date. To travel via plane you need a valid passport (citizens from non-European Economic Area countries) or national ID card (EEA and Swiss citizens). Valencia airport is 9 kilometers outside of the city and is connected via public bus and metro. Buses depart to Plaza de Espana every 20 minutes. A one-way ticket currently costs USD 1.69*. The metro departs for the town centre every 8 minutes and a one-way fare currently costs USD 4.55*. The bus journey takes longer; around 5 hours, but it is the most scenic way to travel from Madrid to Valencia. The bus travels through many small Spanish towns, including Tarancon. 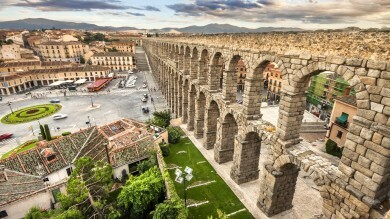 Buses depart regularly throughout the day from Madrid-Barajas Adolfo Suárez International Airport. There are also several departures each day from the Estacion Sur bus station located south of Madrid city centre. Buses are operated by Avanza, a reputable Spanish company. They are air conditioned and comfortable, and offer free wifi to riders. Buses also generally have power outlets and bathroom facilities. On certain longer journeys, movies will be shown to entertain riders. Tickets can be purchased to travel from Madrid to Valencia by bus in advance online, at the Viajes El Corte Ingles kiosk in terminal 4, or from the driver. A one-way ticket currently starts at USD 32.36*. Buses depart from terminal T1, bus parking, as well as terminal T4 in the arrivals area. If traveling from Estacion Sur, tickets can be purchased at the station. Fares currently start at USD 32.27*. One of the easiest ways to travel between Madrid and Valencia is by train. The journey time from Madrid to Valencia on the AVE trains is about 1 hour and 40 minutes. High-speed AVE trains depart regularly from Atocha station in the city centre. AVE trains are operated by RENFE, Spain’s national rail service. Train cars are comfortable and spacious, and offer a wide range of amenities and conveniences. AVE trains arrive at Estacion Valencia Joaquin Sorolla, which is a short 20-minute walk from Valencia’s city centre. There is also a shuttle bus from Estacion Valencia Joaquin Sorolla to the historic Estacion Nord. Simply show your train ticket for a free ride into the city. 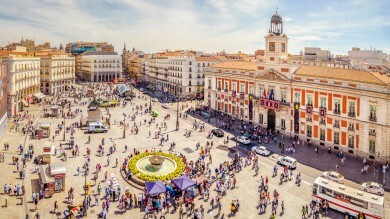 Tickets to travel from Madrid to Valencia by train can be purchased online or at the station from an agent at the purple RENFE automated machines. Tickets for the AVE high-speed train currently start at USD 25.60*. Price increase closer to departure date. Book at least a few days in advance to secure the best deal. Trips via region and intercity trains are also available. The price is significantly less, but the journey time is almost 7 hours. Hiring a car and self-driving to Valencia allows for the most flexibility and freedom to explore at your own pace. The journey takes approximately 3 hours and 40 minutes and passes through a number of charming towns and villages. Established car rental companies are represented at the airport as well as in the city centre. Rates will depend on the company and the length of time you will need the car. Driving from Madrid to Valencia is relatively easy. Take Autovía A-3 (European route E901) south out of the city. Continue on this route, following the signs until you reach Valencia. The minimum age to rent a car in Spain is 21. You will require a valid driver’s license. Drivers under the age of 25 will be subject to a young driver fee, charged at the time of pick-up. Reputable companies at the airport and in the city include Sixt.com, Economy Car Hire, and Auto Europe. The most relaxing and convenient way to visit Valencia is on an organized and guided tour. Most tours will stop at the city’s top attractions, including The City of Arts and Sciences, the Valencia Cathedral, and the Silk Exchange. Many tours will include an overnight stay in Valencia as well as nearby Barcelona. They include transportation and a knowledgeable guide who can share great details about each of the cities. Certain tours will also include entrance fees and daily breakfast. Multi-day tours usually start at USD 580*. A standard tour will start in the morning and will last between three to four nights. Valencia is a charming Mediterranean city that seamlessly combines historic and modern architecture. 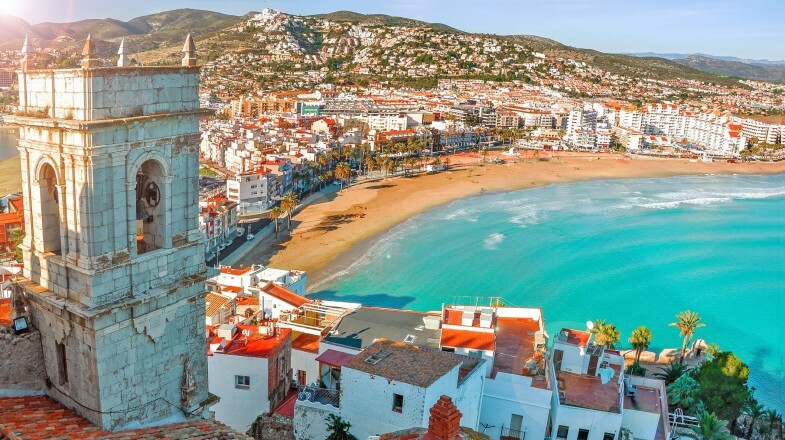 Famous for its breathtaking sights and delicious food, at just a few hours from Madrid, it is well worth the trip. There are many ways to travel between Madrid and Valencia. No matter what your travel style, budget or timeline, there is an option that is best suited to you.